Greetings all; I really enjoy a few rounds of free sparing and as this is an integral part of our training, I would like to give you a few tips to improve your free sparing. 1. Don’t just throw techniques haphazardly; The strength and power of your technique is constantly improving and any “Out of control” use of the combinations and techniques that you practice can be dangerous not only to your training partner but yourself also. 2. Use a combination only once or twice; Then use it again but change the last technique. (Many beginner students tend to repeat certain combinations and end up “telegraphing” making it easy for the opponent to “read” what they are doing so try using several “body” techniques then fake to the body followed by an immediate kick to the another target. 3. Look for openings; Sooner or later your opponent will need to think and they usually hesitate, when this opening occurs take advantage of it and get them on the “back foot”. 4. 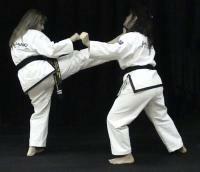 If you cannot avoid, then block: It is usually more desirable to avoid a kick or punch than to block it. 5. When you need to block do so with the correct technique and power; Sometimes this is necessary to avoid being accidently hit (with proper control no one should get hit but, this is a martial art and it can happen). 6. Always be ready to “counter attack”; Immediately after blocking it is usually the best time to counter attack. 7. Keep moving; If you are effective at avoiding and blocking, you may also frustrate your sparring partner and cause openings for your own attacks. Perception: Perception is not just about visual assessment and guesswork, with perception we feel as well as see and it allows us to do as little as possible or cut out unnecessary movement. Perception is seeing, feeling in the "here and now." Relax: Do not try to hit "hard" when you punch, you will tense your shoulders and back, and exhaust yourself quickly so always remember to attack with a relaxed body using speed and body “snap”. People who hit with tension tend to punch with just their arm, which limits power, use your entire body to punch and kick. REMEMBER....Tension also slows reaction time. Shout & Breathe: Breath control is extremely important if you are to remain relaxed and “in control” during sparing. An excellent way to do this is to kiap (shout) frequently and loudly while sparring, It forces you to take deep breaths and demonstrates a fighting spirit. REMEMBER..... Always shout from the abdomen and never hold your breath during a technique. Focus: Aim for the area you wish to attack. Use peripheral vision to foresee where an attack is coming from. Fakes and combinations: Use fakes to set up other attacks but make the fake realistic enough that the opponent must react to it, always attack in combinations of kicks and punches at both high and low, left and right and up and down targets. Try to always keep your opponent off-guard and confused, fakes should be used sparsely and only when there is an intention to attack. Controlled Aggression: Do not wait to “Test” your opponent, get straight to it and keep the pressure on. Balance: Always keep your balance, never allow yourself to get into an off balance position. Blocks and attacks are ineffective if you are off balance and balance is critical for the development of power and speed so, Keep your knees bent at all times and maintain your centre of gravity. Lastly, enjoy your free sparing and make sure you use control.